A large selection of Themed Dinner Cruises to choose from! Buffet includes a variety such as red-skin potatoes in butter, home-made mashed potatoes, vegetables, tossed salad, potato salad, pasta salad, homemade breads. Saturday: Special Menu when Scheduled. Call for availability. Main entrees subject to changes. It's our popular Dinner Cruise with a twist! Enjoy a delicious themed dinner as you cruise the beautiful St Mary's River. 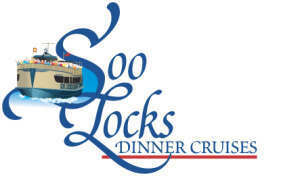 Your evening includes locking through the famous Soo Locks and seeing all the sights along the waterfronts of Sault Ste. Marie, Michigan and Ontario. Group Tour bookings available 7 days a week. Tour dates are available to individuals after group tour bookings. Call for departure dates and reservations at 800-432-6301. Saturday Cruises are Themed Dinner Cruises. Call for possible Sunday departures. Please check back closer to desired cruise date, as more dates become available. Available dates are highlighted in Green. Sold Out dates are highlighted in Red.